It’s all over the news and the reason our legislators are taking a hard look at the state of our education program. Teaching to the test just doesn’t work. It results in unsatisfied teachers and a narrow curriculum…and rarely higher test scores. 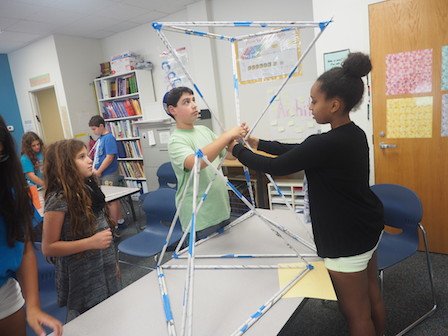 At Mirowitz, our focus is on raising children who are inquisitive, deep-thinking, self-confident learners. We purposely fill childhood with experiences that make profound learning possible. Most importantly, we allow our students to construct knowledge. Think about something you do particularly well: your profession, a hobby, a volunteer leadership role, parenting. Did you hone your skills by reading a “how to” manual? Did you become an expert in a college auditorium? Probably not. More likely, you learned through experience, and that’s why you have excelled. The same is true for your children. Their teachers do not see them as blank slates upon which they will write the information they want to impart. Instead, they create opportunities for your children to discover that same information through experience. That is the heart of constructivist learning, and that’s why your children are so enthusiastically engaged every moment of the day. We don’t focus on teaching to the test. But it turns out that a curriculum that encourages problem-solving and intellectual risk-taking also prepares students for success on standardized tests. (Did you see in the Jewish Light how well our 2015 high school alumni did on the ACT? The middle 50 percent scored 30-33.) We didn’t spend their childhood preparing them for success on a test. We prepared them for success in life.